Blackboard and chalk have become symbols of traditional teacher-centred classroom, unwillingness to change and technological inferiority of schools. There is a story comparing teacher and surgeon who lived two hundred years ago. If they would come from the past, the surgeon wouldn’t recognize operating room at all, while teacher would just pick up a chalk and continue to write on a blackboard. 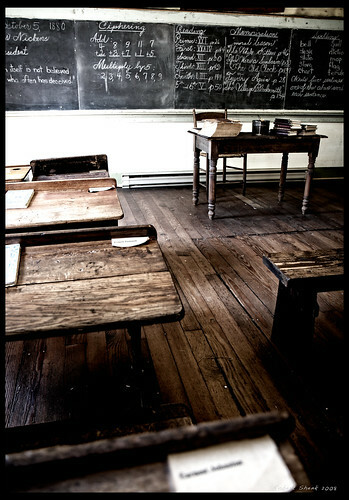 Although blackboard and chalk’s simplicity looks completely outdated in the age of ubiquitous information technology, it was a central instructional tool for about two hundred years and it is hard to imagine classroom without a blackboard, or a whiteboard as a more advanced version of it, hanging on the frontal wall. Invention of blackboard is widely attributed to James Pillans, headmaster of the Old High School of Edinburgh, Scotland. James Pillans wanted to make his geography lessons visible to all students at the same time so he took the slate boards from the students and put them together on the wall thus creating a primitive blackboard. This idea was transferred to the United States by Mr. George Baron who taught math at West Point Military Academy. The usage of blackboard spread all over America by the 1850s (Why is the blackboard green?, n.d.). Although invention of blackboard can be attributed to a genius of one man, it is also a product and a factor of a specific socio-economic and cultural context. One of the common characteristics of America and Europe at the time blackboard was invented and diffused was rapid expansion in the overall population. Clack and Neely (2005) states that from 1690 the American population had doubled every twenty five years until, in 1775, it rose to more than 2.5 million. According to Gillard (2011), British population rose from seven million in 1751 to fourteen million in 1821 and finally to twenty-six million in 1871. This rapid expansion was accompanied with increase in the proportion of urban population and children (Gillard, 2011). Europe and America in this period experienced many dramatic changes including industrial and social revolutions (e.g. French Revolution in 1789), birth of new nations (e.g. the United States of America in 1776), democratisation, rapid technological progress, secularized civic politics, etc. Gillard (2011) suggests that these huge social, political and economic changes uncovered the inadequacy of England’s educational provision. Numerous reports brought up the deficiencies and required more and better schools. For example, one report including 12,000 parishes in 1816, found that 3,500 had no school, 3,000 had endowed schools, and 5,500 had unendowed schools, both of varying quality. To close the gaps, various types of school were established in England to provide some basic education to the masses as stated by Gillard (2011). He reports that number of schools and school attendance was rising from about 58% in 1816 to about 83% in 1835, although the average period of time of school attendance was just one year. Martin (1994) argues that civil authorities in 19th century regarded schools as a means for better integrating citizens into society. For example, Gaffield (n.d.) argues that in the years after the Conquest of 1759-60, the British authorities, that were concerned about the strong French Canadian presence in the colony, tried to establish schools outside the control of religious authorities. 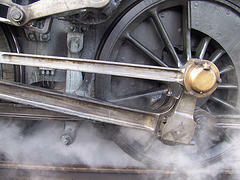 Invention and implementation of blackboard represents remediation as defined by Bolter (2011) – a newer technology taking place of older technology but keeping some characteristics of older technology while reorganizing and improving other characteristics. 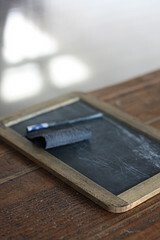 Blackboard imitates slate board in its rectangular shape, material – slate, and functionality – writing and erasing. The main physical differences in comparison with slate boards are blackboard’s size and position – blackboards were much bigger than slate boards and they were hung on the wall while slate boards were held by individuals in their hands. Bigger size enabled much more text to be written on it, as well as visibility to all students in classroom. Chalk that replaced piece of slate for writing enabled easier and faster writing and cleaning. Implementation of blackboards meant transition from exclusive oral lectures to lectures enriched with strong visual elements – words, drawings or other visual elements. Transition from hearing-dominance to sight-dominance that started with invention of print (Ong, 1999), as a dominant technology, took place in schools with blackboards, as secondary technology addressing the needs that cannot be easily met by dominant technology (Bolter, 2011), only more than three hundred years later. However, writing on blackboards has both characteristics of oral and written communication. The ephemeral nature of words written on blackboards that can be easily erased make them similar to oral expression. Before spread of notebooks and textbooks in schools, memorization and repetition were predominant teaching methods as suggested by DeWaard (2011). Verbal memorization and repetition were central to verbal learning in oral cultures even though Ong (1999) argues that these processes were quite different in oral than in writing cultures. Additionally, text on blackboard was accompanying a lecture or demonstration for a specific audience similar to performances of oral poets. On the other hand, text written on blackboard has qualities of literacy – it is abstract and isolated from the natural context (Ong, 1999). The simple act of putting slate boards on wall has caused a substantial change in teaching and education in general. Thanks to blackboard, teachers did not have to waste time approaching each student to write problems and lessons on their slates. Instead, teachers could stand in front of the whole class to teach thus saving precious time (Who is the inventor of the chalkboard?, n.d.). 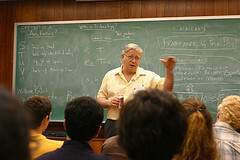 Lecturing to the whole class with use of blackboard made teaching more efficient and standardized. Thanks to its affordances – possibility to easy and quickly write or draw on its huge surface, which is visible to relatively big audience, blackboard enabled efficient instruction necessary for universal state- or local government-supported education. Bolter (2011) states that remediation is always an attempt to redefine key cultural values. In opposition with decentralized varying education before blackboard, in 19th-century America and Europe it was important to educate huge mass of learners in an efficient and standardized way and blackboard was an ideal tool for that. In America, thanks to developed railway system, the blackboards were delivered in most remote areas and mere look at the classroom layout with blackboard in frontal position was enough to recognize the centralized effort of the government to provide universal education. The other cultural value redefined by blackboard is group vs. individual instruction. While education at home, which was widely spread before introduction of public schools, might provide more individualised approach, public schools offering frontal instruction aided with blackboard represented unified group instruction. As described by Bumstead (1841), implementation of blackboards in schools did not go without resistance. At that time blackboards were not present in many schools and many teachers could not use them adequately. The resistance against blackboard as a new technology was partially resistance against changes of cultural values that use of blackboards brought about. 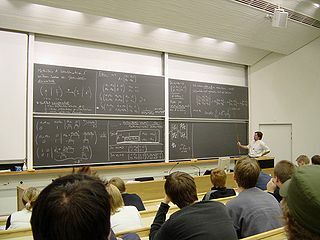 In order to overcome limitations of blackboard such as lack of space, need of constant cleaning and hazard of chalk dust, new advanced boards have been developed such as double or quadruple blackboards, revolving boards, whiteboards and interactive whiteboards; but they have not entirely replaced old blackboard. Brown and Race (2002) state that even today most lecture halls still have blackboards or whiteboards while for some subjects blackboards remain favoured tools, such as maths, science and engineering, taking advantage of students being able to watch teachers write out derivations and proofs. Advocates of blackboards, like Ressler (2004), emphasize its simplicity and reliability. Ressler, Welch and Meyer (2004) argue that blackboard is a powerful tool for interactive classroom instruction, rather than a barrier to interactivity thus opposing to critics who often use offensive phrase for instruction aided with blackboard – chalk and talk. 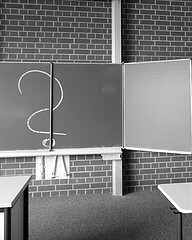 Although many schools have been switching to whiteboards and interactive whiteboards, often called ‘blackboard of the 21st century’, old-fashioned blackboard will still have its place in classrooms because it is cheap, easy to use and reliable, at least until school remains as we know it. Bolter, J. D. (2011). Writing space: Computers, hypertext, and the remediation of print [2nd edition]. New York and London: Routledge. Martin, H. J. (1994). History and power of writing. Chicago and London: The University of Chicago Press. Ong, W. J. (1999). Orality and literacy. London and New York: Routledge. This entry was posted in Research Paper and tagged blackboard, chalk, chalkboard, remediation. Bookmark the permalink. I love your introduction about a teacher from 200 years ago recognizing his/her tools in today’s classroom. I sure hope he/she wouldn’t recognize the teaching methods. Hi Steph, I hope the same. A very well thought out discussion on the role of blackboard. I agree with you that “old-fashioned blackboard will still have its place in classrooms because it is cheap, easy to use and reliable.” Not a lot of schools can afford the expensive, interactive white boards and while I agree that they can get the learners’ attention due to their functionality, how more advantageous are they really to improving learning? Hi Leonora! In general, I think that particular educational tools are more appropriate for particular purposes, but many educational tools can be used for a variety of different purposes. It is up to teacher to use the tools in a way they really improve learning. One can use the most advanced tools without improving learning and vice versa. Tony Bates said that good teaching may overcome a poor choice of technology but technology will never save bad teaching.